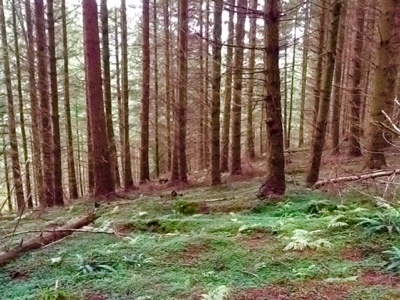 A conifer plantation: tall maturing trees, widely spaced with little to impede a walk through the towering silent softwoods. No breeze, a soft overcast light. I can hear a buzzard (or some bird of prey), small birds, an occasional distant car and some mountain bikers whose voices echo across the hillside. I sit on a carpet of pine needles and small wood sorrel plants that cover the ground like a dusting of green snow. I like sensing the three dimensional space that surrounds me. Although I am just sitting with my back against a tree I focus on objects around me and try and imagine what they feel like with respect to temperature, moisture, texture etc and their place in the landscape. It is as though I am imagining myself being everywhere around me and not just within. I have written before about finding space, peace and separation from technology in places like this over the years so I am trying to find new things to write about. With quick fleeting visits to these places that isn't always easy. Over my life I have explored many woods like this and, generally they are quite safe places as long as one takes a few precautions. Forestry tracks can suddenly stop in the middle of nowhere or deviate from maps so having a good sense of direction is important. Fortunately, in this area of the country there aren't any vicious wild animals or venomous snakes that can cause harm. The only things that really worry me are ticks. They aren't too prevalent around here as in some parts of the country but I always check myself over when I get home. I was never too worried about falling branches until I watched a tv programme about american loggers who had armour plated logging machines. So far, in 50 years, I have never had a branch fall next to from high up and I generally avoid woodland in strong winds. Oh, and it is generally a good idea to avoid wood ants and gamekeepers.